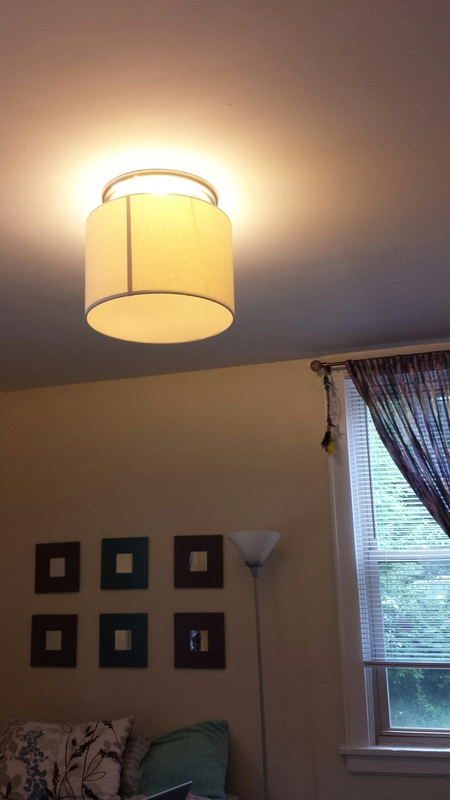 I finally finished my bedroom overhead lamp project. 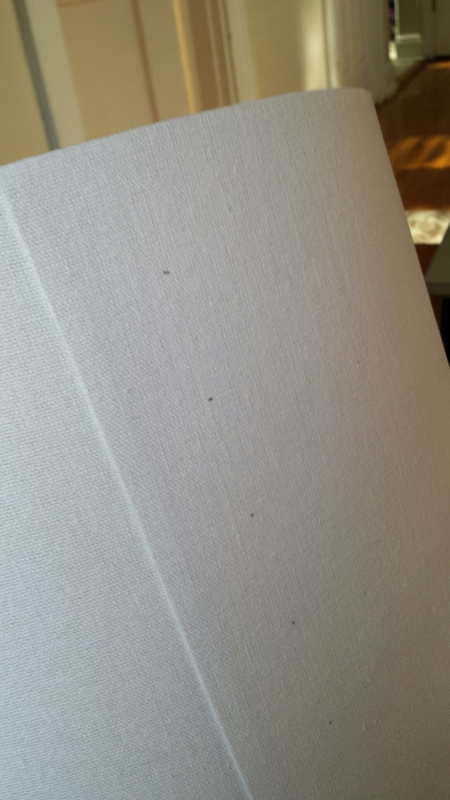 After determining that my clearance West Elm shade fit and looked good, I took the lamp shade down again and started making very faint pencil marks on the shade where I wanted to tape off some lines. You can see the lampshade that inspired my design in the background of the second photo. I used artists tape, not painters tape, mostly because I already had it left over from a diy wall art project but also because it’s easier to find in smaller widths. 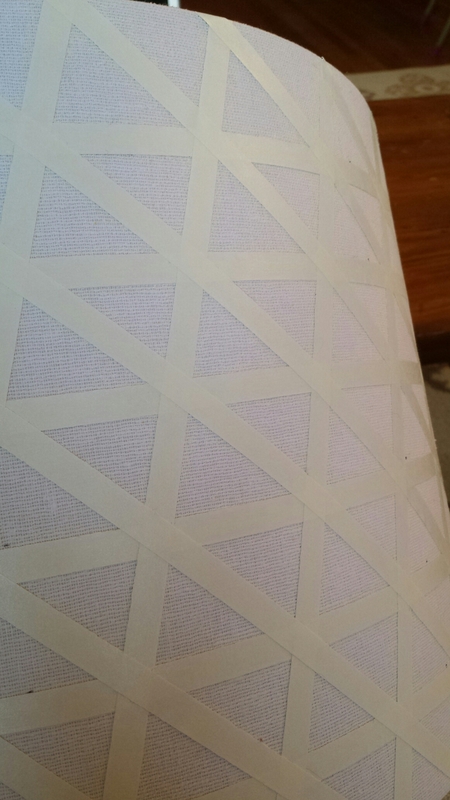 However, it doesn’t seal as well, so you do get some paint bleeding under the tape edges. I was okay with that because I wanted a less precise, almost watercolor-esque design. 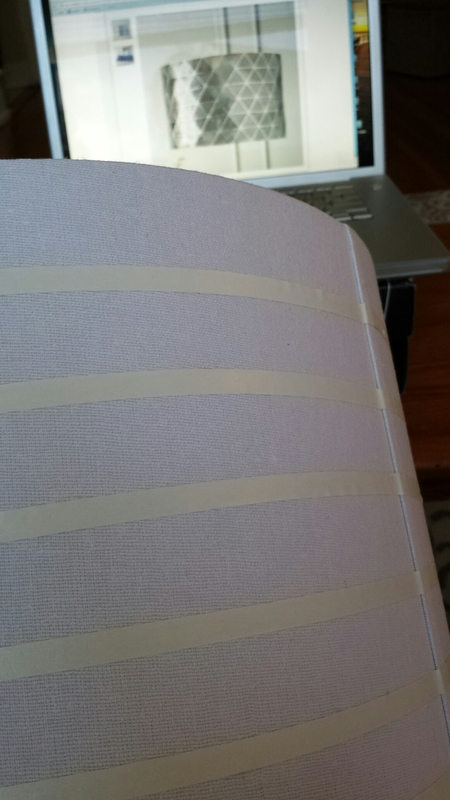 I did not measure the diagonal tape strips. If you want this even, you definitely should. And then I painted. And painted. And muttered evil things about large lampshades. Things to note: the silver paint is fairly opaque, so the shade doesn’t let as much light through as it did before I painted it. Light still comes through at the top and bottom and through the parts that were taped off. I have two other lamps in this room, so it’s not an issue for me. 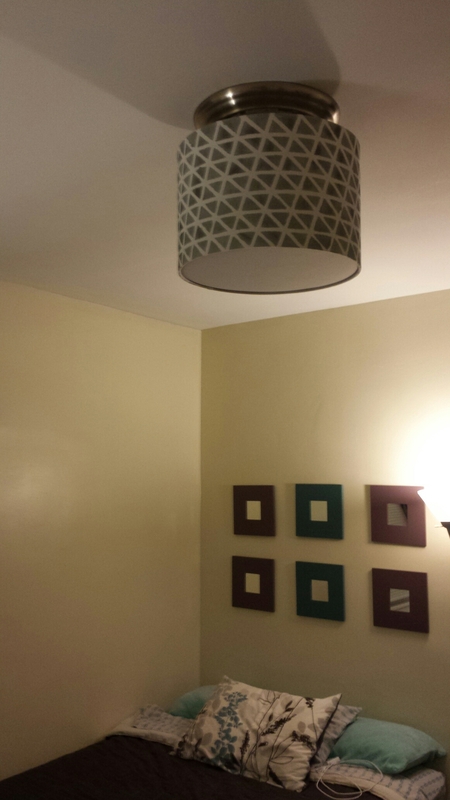 Just don’t paint your entire lampshade black and then wonder why your room is suddenly so dim. 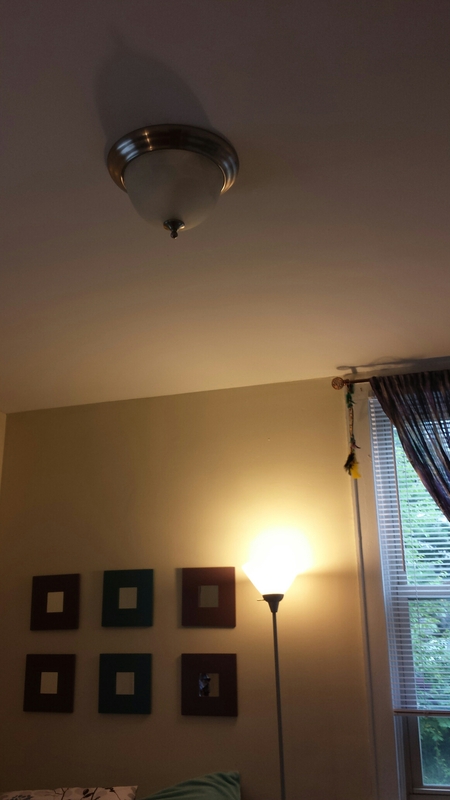 The new apartment has some ugly overhead light fixtures. Turns out, at one point Young House Love (one of my favorite blogs), had the same ugly light fixtures in their house. 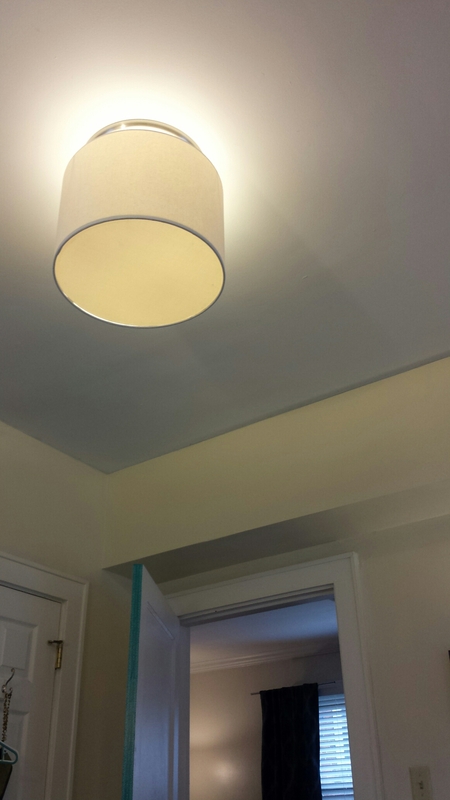 Inspired by how creatively they disguised their ugly light fixtures, I have embarked on Operation Pretty Ceiling Lights. Or PCL, if you want to sound like you’re doing something really weird. So my floor lamp isn’t that pretty either. Whatever. I snagged a pendant drum shade from west elm on clearance and then let it sit in its box for a good week before getting around to testing whether or not it fit on the light fixture. This is not the end of the project though. I want to paint the lampshade so it goes better with the bedroom decor. Oh and then I’m going to tackle the living room ceiling light! Gosh my life is exciting.